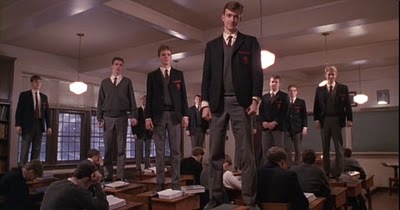 In high school, my girlfriends and I were obsessed with the movie Dead Poets Society. I’m not sure if that was because we wished we had a teacher like Robin Williams or a boyfriend like Ethan Hawke… perhaps both. The movie was released in the summer before grade 11 and over the next two years, we watched it repeatedly. One of the gang lived next to the school so we would often go to her house if we had a double lunch or an after-school project. The movie would get turned on for background entertainment. We quickly adopted the movie’s philosophy for ourselves. Should we drop in to visit the guys? Carpe Diem! Should I try out for the play? Carpe Diem! Should I call and ask him out? Carpe Diem! Should we skip chemistry? Carpe Di… nah, we’d better not. Although we weren’t wild enough to skip that chemistry class, we showed geeky rebellion by writing anonymous articles for the school paper under the nom de plume “the CPDs”. Oh yeah, that’s right! Anyway… this trip down memory lane is all due to the amazing belated birthday present I received in the post today. I met the giver of this gift in grade 10 and we quickly became tight friends. Yup, you guessed it, she was one of the infamous CPDs! Even though we attended different universities we were inseparable in the summers and could always be found dancing (usually on a speaker) into the wee hours on the weekends. 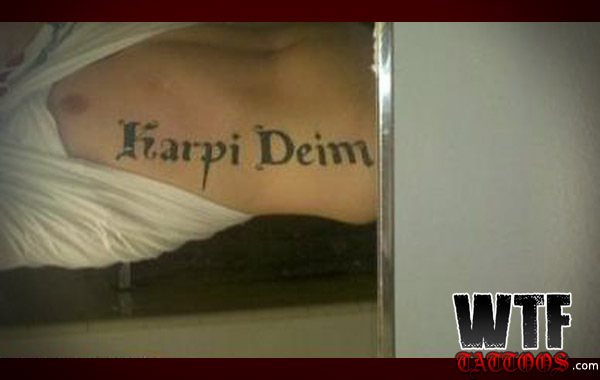 Carpe Diem continued to be our philosophy. She now lives in Waterloo but remains my BFF (to use her daughter’s vernacular). Oh Captain! My Captain! Imagine me standing on a desk. My words are inadequate to express how much I love this! I think I’m the one on the right. 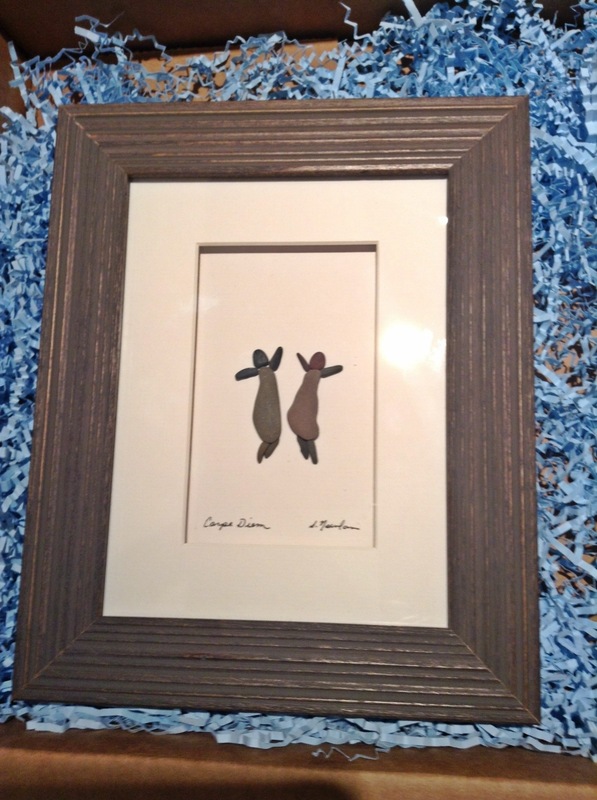 NOTE: BFF is not the artist – I do not actually know Sharon Nowlan. My friend purchased this as a gift after having discovered the artist herself. 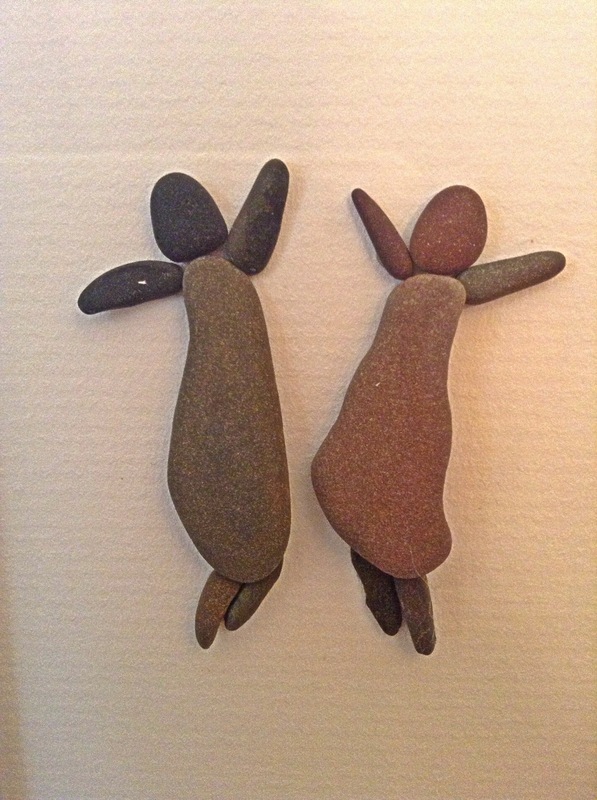 This entry was posted in General and tagged Birthday, Carpe Diem, Dead Poets Society, Funny, Nova Scotia, Pebble Art, Relationships, Sharon Nowlan. Bookmark the permalink. Anonymous writings?! Holy crap you gals were crazy! I’ve never seen that movie you mention because I’ve always found Robin Williams to be an insufferable douche, but…well crap, there was really no point to this second paragraph but I feel as though I’ve typed too much to erase it now. Cheers! Happy belated birthday as well. Hey Don, stop cracking my husband up… that’s my job! Sorry! Does he feel the same way about Robin Williams or your craziness? Lol. She should have placed two rectangular stones below both of you — for speakers! I’ve just added a note above, for clarity… my friend is not the artist. But how cool would that be?!? A whole scene full of drunken pebbles! I watched this film during a literary class when I was 16, everyone cried. Nice gift. We all cried every time, too! Thanks for your comment. I’m so glad to hear the younger generation is still somewhat aware of this movie… even if it is only those lucky enough to have the right professor.